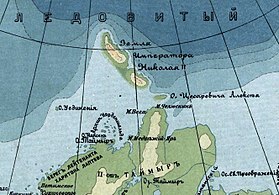 Russia was defeated in the 1904–1905 Russo-Japanese War, which saw the annihilation of the Russian Baltic Fleet at the Battle of Tsushima, the loss of Russian influence over Manchuria and Korea, and the Japanese annexation to the north of South Sakhalin Island. 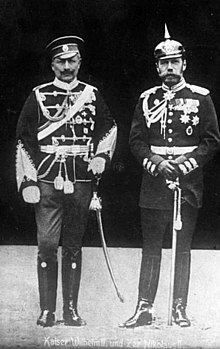 The Anglo-Russian Entente was designed to counter the German Empire's attempts to gain influence in the Middle East, but it also ended the Great Game of confrontation between Russia and Britain. 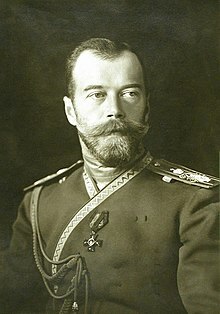 When all diplomatic efforts to prevent the First World War failed, Nicholas approved the mobilization of the Russian Army on 30 July 1914, which gave Germany formal grounds to declare war on Russia on 1 August 1914. An estimated 3.3 million Russians were killed in World War I. 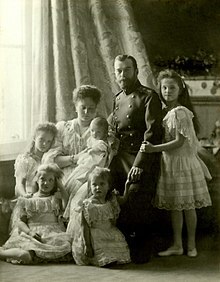 The Imperial Army's severe losses, the High Command's incompetent management of the war effort, and lack of food and supplies on the home front were all leading causes of the fall of the House of Romanov. As the government failed to produce supplies, mounting hardship resulted in massive riots and rebellions. 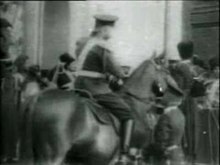 With Nicholas away at the front from 1915 through 1916, authority appeared to collapse and the capital was left in the hands of strikers and mutineering soldiers. 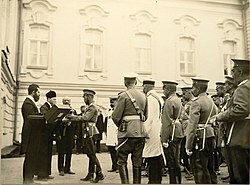 Despite efforts by the British Ambassador Sir George Buchanan to warn the Tsar that he should grant constitutional reforms to fend off revolution, Nicholas continued to bury himself away at the Staff HQ (Stavka) 600 kilometres (400 mi) away at Moghilev, leaving his capital and court open to intrigues and insurrection. 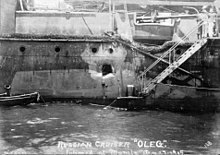 By early 1917, Russia was on the verge of total collapse. The army had taken 15 million men from the farms and food prices had soared. An egg cost four times what it had in 1914, butter five times as much. The severe winter dealt the railways, overburdened by emergency shipments of coal and supplies, a crippling blow. 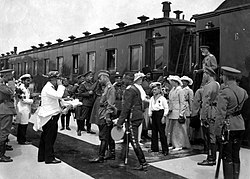 Russia entered the war with 20,000 locomotives; by 1917, 9,000 were in service, while the number of serviceable railway wagons had dwindled from half a million to 170,000. In February 1917, 1,200 locomotives burst their boilers and nearly 60,000 wagons were immobilized. 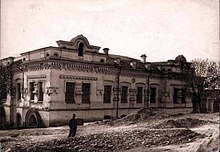 In Petrograd, supplies of flour and fuel had all but disappeared. War-time prohibition of alcohol was enacted by Nicholas to boost patriotism and productivity, but instead damaged the treasury and funding of the war due to the treasury now being deprived of alcohol taxes. 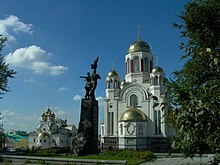 Michael was proclaimed as "Emperor Michael II" to Russian troops and in cities throughout Russia, but his accession was not universally welcomed. While some units cheered and swore allegiance to the new Emperor, others remained indifferent. 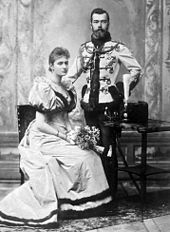 He declined to accept the throne until the people were allowed to vote through a Constituent Assembly for the continuance of the monarchy or a republic. 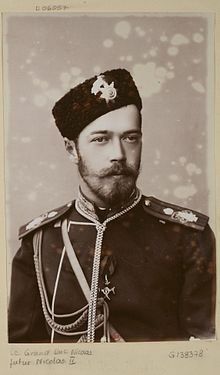 The abdication of Nicholas II and Michael's deferment of accepting the throne brought three centuries of the Romanov dynasty's rule to an end. 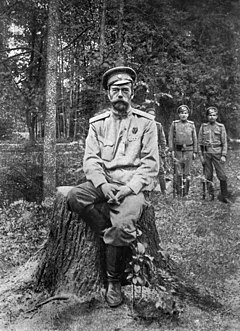 The fall of Tsarist autocracy brought joy to liberals and socialists in Britain and France. The United States was the first foreign government to recognize the Provisional government. In Russia, the announcement of the Tsar's abdication was greeted with many emotions, including delight, relief, fear, anger and confusion. ^ a b Vammen, Tinne (15 May 2003). "Louise (1817–1898)". Dansk Biografisk Leksikon (in Danish). ^ a b Phillips, Walter Alison (1911). 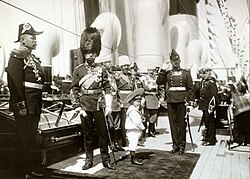 "Nicholas I." . In Chisholm, Hugh (ed.). Encyclopædia Britannica. 19 (11th ed.). Cambridge University Press. ^ a b Lesser, Joh. "Vilhelm, Landgreve af Hessen-Kassel". In Bricka, Carl (ed.). Dansk biografisk Lexikon (in Danish). XVIII. ^ a b Thorsøe, A. "Charlotte (Louise C.)". In Bricka, Carl (ed.). Dansk biografisk Lexikon (in Danish). III. 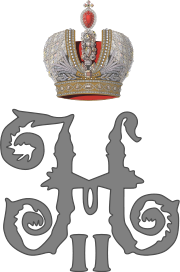 This page is based on the Wikipedia article Nicholas II of Russia; it is used under the Creative Commons Attribution-ShareAlike 3.0 Unported License (CC-BY-SA). You may redistribute it, verbatim or modified, providing that you comply with the terms of the CC-BY-SA.